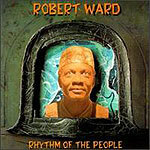 CD review: "Rhythm of the People"
The comeback story of the decade, Robert Ward resurfaced two years ago after almost 20 years away from the national music scene. Ward is best known for the haunting guitar on Wilson Pickett's big hit with the Falcons, "I Found a Love," and as founder of the Ohio Untouchables, which later became the Ohio Players. "Rhythm of the People" picks up where 1991's "Fear No Evil" left off, with Ward's signature stylings on guitar punctuating his own syncopated compositions and his hoarse vocals leading the way. This is some of the most distinctive blues/R&B you'll ever hear. Ward is one of the most imaginative guitarists around, has a knack for penning great hooks into his songs, and the backing band is superb.